The Gazebo at Sunset Ridge Buffalo Farm offers the peace and tranquility of an island setting on a rural lake with a modern out- door kitchen and large lake fountain featuring lights that illuminate the night. The Gazebo at Sunset Ridge Buffalo Farm is ten-sided with a 33 ft. diameter (over 900 sq.ft.) and can be configured to seat 95 guests for weddings, or up to 80 at tables for dining. Adjacent deck seats up to 70 guests for weddings or 40 at tables. Curtains are available for inclement weather. The Gazebo Island also has electrical outlets available for client provided PA systems, musical systems, or special lighting. Rates for renting The Gazebo are based on the size and amenities required for each group. 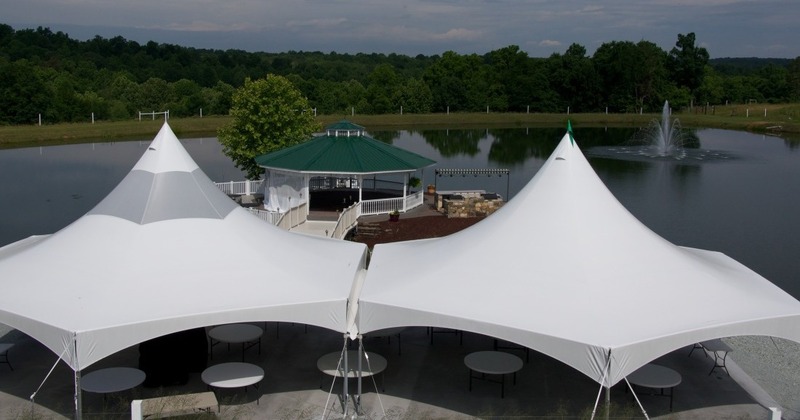 Two 40 ft. high peak hexagonal tents (2080 sq. ft.) on concrete are available for receptions and meetings. With lighting and optional sides, the tents seat up to 180 at round tables or 225 in row seating.